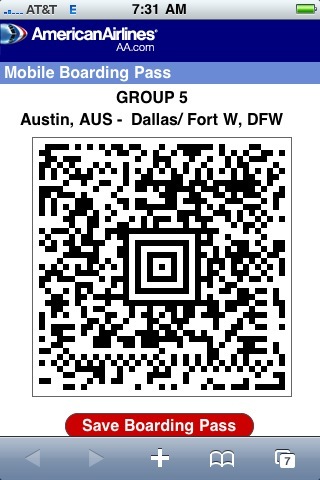 When I checked in for my flight last night I saw a new option for a mobile boarding pass. “About time” I thought and eagerly chose that option, how many others would have done the same vs saying “I don’t know how that works so I’m going to go with the standard option.” When I got to the TSA agent and showed her my phone, she pointed to some free standing piece of machinery. I took my phone and began to flash the below barcode to various areas on the device that I figured might have been a barcode reader(I was way off). The TSA agent got frustrated with me and started barking orders at me until I got it right. Needless to say I looked pretty stupid for a bit, but now it’s done and I know how to use it. It serves as a reminder to me that I need to always try the cutting edge stuff to stay an early adopter and not be complacent with what I’m used to. I invite others, including my mother to do the same.